This Whipped Cream Frosting makes the perfect whipped cream that will keep in the refrigerator several hours without separating. It is thick and creamy and oh so good. You can use it as a filling for cakes, as a frosting, you can pipe it, or it can be used simply as an accompaniment to a slice of pie, a bowl of fresh fruit, or to garnish a pudding. I have included recipes for vanilla flavored whipped cream (also called Chantilly Cream), raspberry, strawberry, lemon, chocolate, and even a mocha flavored whipped cream. The trick to making Whipped Cream Frosting is to have the cream, the bowl, and the wire whisk very cold, as this will help the cream reach its maximum volume when whipped. It is best to use a metal bowl and place it in the freezer, along with the wire whisk, for at least 15 minutes. Now, you need to use heavy cream, also known as heavy "whipping" cream (outside the U.S. it may have a different name). This is cream with a butterfat content of between 35 - 40%, which means it will double in volume and reach stiff peaks when beaten. When beating the cream, add it to the cold bowl, along with the vanilla and sugar. (I like to add the smaller amount of sugar to start as you can always add more if needed.) Start the mixer at low speed and gradually increase the speed to high. Depending on what you are using the cream for, beat just until soft or stiff peaks form. Watch carefully, because it is very easy to beat the cream until it almost turns to butter. If you do accidentally over beat, just add a little more cream and beat until soft or stiff peaks form. If you do plan to store the whipped cream in the refrigerator you will find that eventually it will separate. If that happens, simply rewhip. If you want to stabilize the cream so it will not separate when stored, take about 1 teaspoon unflavored gelatin and sprinkle it over 1 tablespoon cold water. Let it stand about 5-10 minutes or until it has softened and swelled (bloom). Then heat it gently (I do this in the microwave in 5 second intervals) to dissolve the gelatin. Then whisk it into the softly whipped cream. Cream is the fat that rises to the top of whole milk and it has a smooth, satiny texture. It is labeled either as "pasteurized" or "ultra-pasteurized". Most creams that you buy today are ultra pasteurized, which is cream that is made by briefly heating the cream to around 300 degrees F (150 degrees C) to kill the bacteria that can cause it to sour. It has a much longer shelf life than pasteurized creams. Keep in mind that not all brands of heavy creams taste the same and since cream is the main ingredient in this recipe, you want to use the highest quality that you can afford. My best advise is to try a few brands until you find one with great flavor that is at a good price point. Also, use the amounts of sugar and vanilla extract as a guide, so adjust them to your own personal taste. 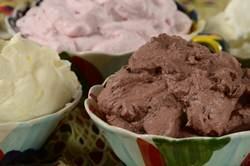 For the raspberry and strawberry whipped cream, you can use either jam (or preserves) or sauces (purees). Lemon Whipped Cream: Make the whipped cream frosting but beat only until very soft peaks form. Then add the chilled lemon curd, and beat just until stiff peaks form. Taste and fold in more sugar or lemon curd, as needed. If not using immediately, cover and refrigerate. Makes about 2 cups (480 ml) whipped cream.